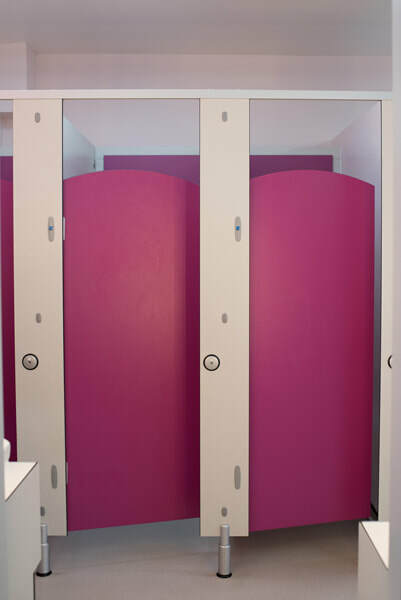 This large girls changing room was painted a pale blue and had a serious lack of storage when we first viewed it. 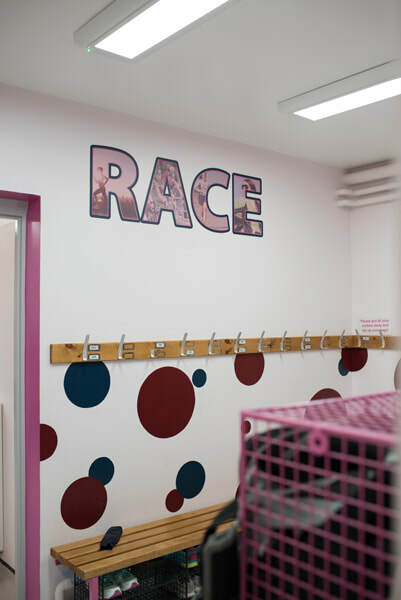 The client brief was to create a fun space that the young girls would love and take care of! I wanted to incorporate the school colours of dark navy blue & burgundy wine red – but not make these too dominant. Although it can be seen as stereo typical, the feeling was that using pink for girls was o.k. – and would in fact be welcomed by the young girls. 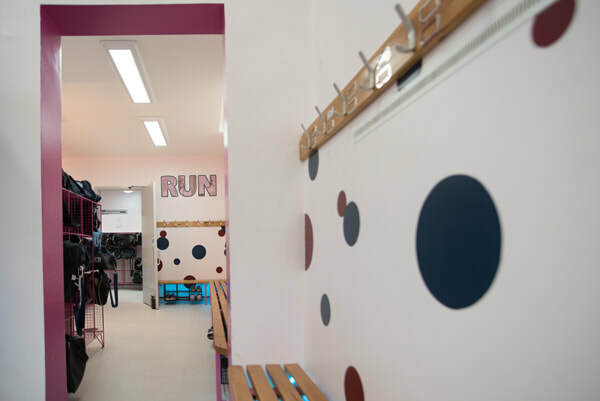 It is such a fun, dynamic colour to decorate with so I was excited to use it in the scheme but also to make the space an empowering one with a strong message that girls can achieve anything they want. 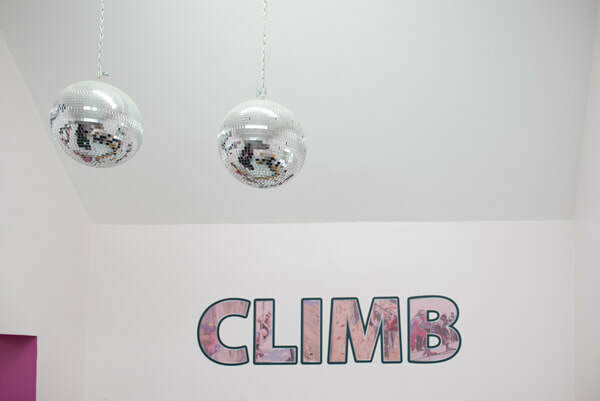 The overall theme for the space was to be active, have fun and be confident that you can do anything! 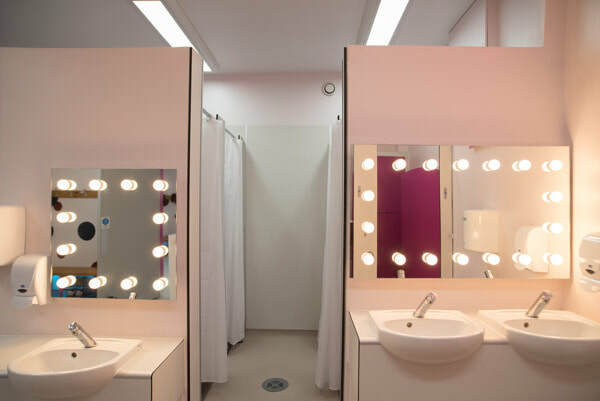 A pale pink was used on all of the walls – ideal as this ground floor space had little natural light and felt quite cold before. The pink hue added a lovely warmth to the rooms. I added in lots of storage – hooks for hanging uniform and metal cages for storing away shoes and sports bags. The cages were sprayed a hot pink to continue the theme. 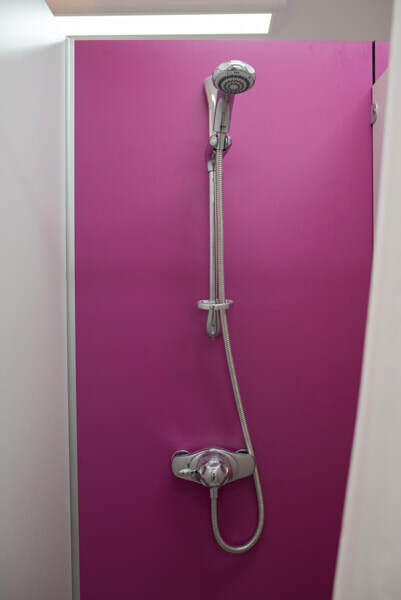 The hot pink was also used on lavatory doors and in the new shower area. 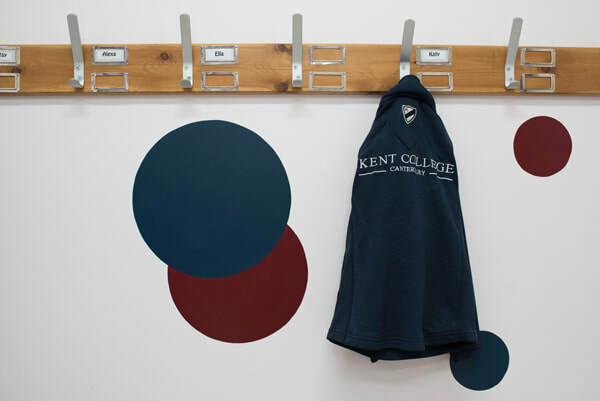 I used bespoke wall graphics throughout the changing room. 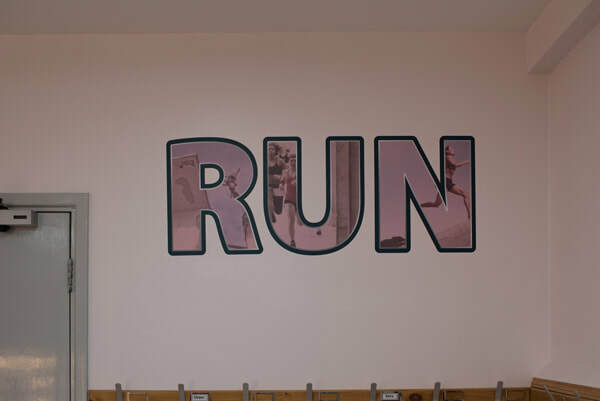 My design was to take active words – such as ‘jump’, ‘climb’, ‘run’ and fill these words with images of women doing sports – from ballet to rugby, swimming to yoga. 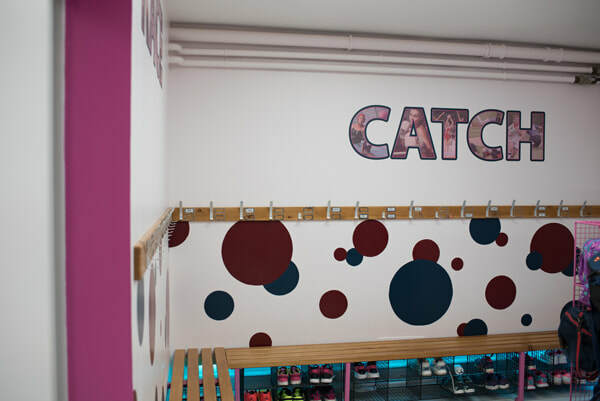 I introduced the school colours in ‘bubble’ shapes hand painted across the walls. 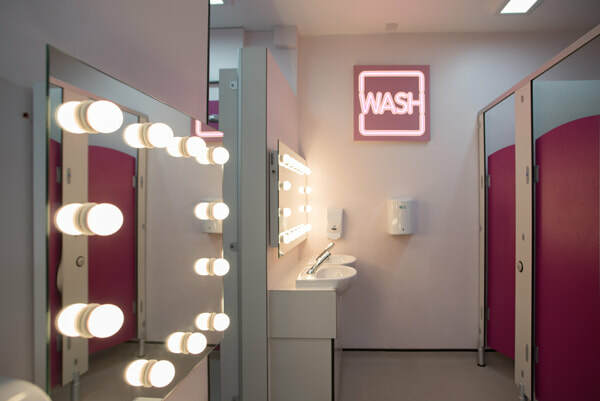 I also added in some fun additional elements to the scheme, a bespoke neon wall light that says ‘WASH’, Hollywood style light bulbs around the mirrors, LED colour changing lighting to below the benches and a couple of disco balls for good measure! 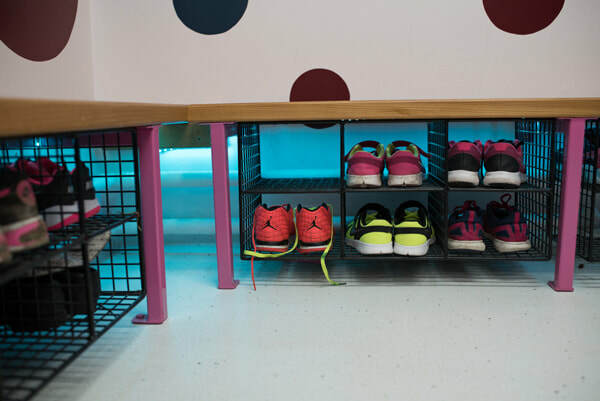 This space is really one that makes you smile – it’s functional and FUN!